Don Dominio / Mr Domain Review 2019: Is Don Dominio / Mr Domain a Good Hosting? MrDomain offers easy domain management and allows you to build high-quality websites thanks to the free website builder it offers. You can expect a quality support system with dedicated server administrators looking after your website. Mr Domain (known as Don Dominio in its native Spanish) is based in Europe and has been in the web hosting business since 2007. It prides itself on being a reliable registrar and hosting provider for your websites. You can expect affordable packages, easy management of your domains and a great support staff when you become their customer. One of the most attractive features at MrDomain is the availability of a free website builder with all their hosting packages. Using the website builder, you can design your website by yourself without needing any kind of programming knowledge. What’s more, with the help of the one-click installer, you can easily install robust scripts like WordPress, PrestaShop, Magento, and so on. These platforms allow you to manage your own blog, professional website, or online shop. MrDomain’s hosting packages include PHP 7.0 support as well as MySQL databases and phpMyAdmin. You get access to an easy-to-use control panel where you can access different website-related statistics and check on your account’s available resources. This ensures that you’re in control of your website’s performance at all times. They also have a team of system administrators monitoring the servers to ensure your website stays online without you having to worry about the technical details. Accessing webmail is also made easier and quicker. You can configure the email accounts on your smartphone, tablet, or computer, and even connect them to email management software like Outlook and Thunderbird. The built-in antivirus and antispam filters ensure you are safe from any malicious viruses that might creep in through the emails. MrDomain’s shared hosting packages start you off with 1GB of storage, 25GB of monthly bandwidth, and 25 email accounts. Larger professional websites can go for their Corporate package, which comes with 20GB storage, 300GB monthly traffic, and 50 email accounts. MrDomain’s packages are divided into four categories: Basic, Professional, Advanced, and Corporate. The Basic package is priced competitively with similar offerings in the market. As you opt for their more expensive packages, the resource allocation increases, ending with 20GB disk space and 300GB monthly bandwidth in the corporate package. Similarly, you get fifteen email accounts with the Basic package, which increases to twenty in the Professional package, thirty in the Advanced package, and fifty in the Corporate package. What’s good about these email accounts is that you get a separate storage for your email accounts, so you can utilize the available disk space for your website only. I did find their Corporate package rather expensive though. For the price they’re charging, I would expect to get unlimited disk storage and bandwidth at minimum. You can try out their packages for 30 days and get your money back if you don’t like their service. As far as their customer support is concerned, they have compiled a list of articles you can read to inform yourself about how the features work. If you still can’t find the answer you’re looking for, you can reach them through the contact form on their website, though their response times can be rather slow (within 24-48 hours, but only on business days). If the query is urgent, you can always utilize the live chat facility; however, like their email support channel, this is only available during office hours. MrDomain offers all the features you can expect from a good hosting company. 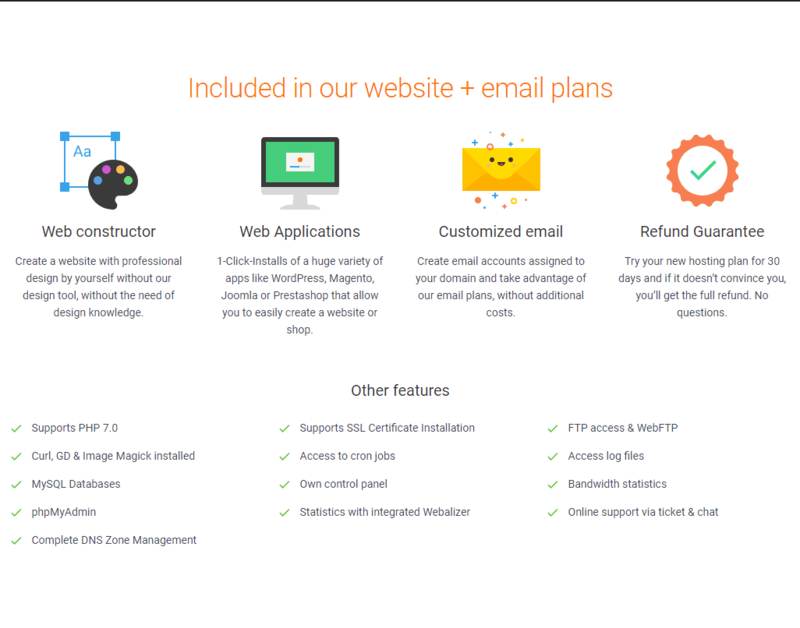 The free website builder sets them apart and is a great value. With an easy-to-manage control panel and no need to know coding, MrDomain is a solid choice for beginners and time-pressed business owners. Wondering how Don Dominio / Mr Domain stacks up against other Web Hosting companies? Enter any other Web Hosting company and we will give you a side-by-side comparison.